Earlier this week, fearless warriors all over Delta V were able to challenge Nightmare Kartherax at long last! Now, they'll be able to explore the Nightmare and uncover its mysteries in this content-rich release with 30 new missions! The following changes are designed to address some of the imbalances with players in the high 30s matching with high rank Legendary players. Additional changes to mission tracking will allow Juggernaut victories to count toward 2v2 missions. 38s and 39s should encounter high rank Legends less often. Promotional Package Phantasm Droids now properly tagged as seasonal rares. We're releasing 2 new achievements, including a new upgradeable achievement! HalloWarrior 2. This will replace the HalloWarrior achievement after this year. The original HalloWarrior achievement will go rare after this season! Upgradeable Achievement: Pumpkin Seed. Can you afford to become a Pumpkin God? The West Naval Yard is under siege by a malevolent force! Many of you have already discovered the tear that leads to he Nightmare realm, but now it's time to discover why all this is happening and how it relates to the various characters in the Naval Yard and Beyond! Note: Defeating Legendary versions of NPCs will not count toward the mission. Also, The Pirate's Nightmare chain will only open after you've complete Waves of Wrath Part 3. For those who haven't yet complete Waves of Wrath, there's a fun mission chain you can do immediately! These mild missions are a great way to boost your credits to help you grab the latest seasonal gear and achievements! I'd like to extend my thanks to all of you who applied during out call for testers. 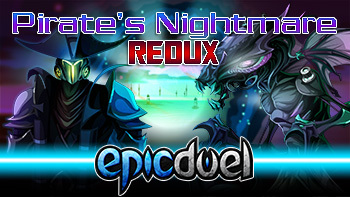 It was very nice to see so many people eager to help EpicDuel thrive and become a part of it's development. We're still reviewing applications and narrowing the list, but when we've determined the final candidates, we'll reach out to them individually for interviews. We'll post the final list when the testers have been interviewed and approved. We thank you in advance for you patience during this process!